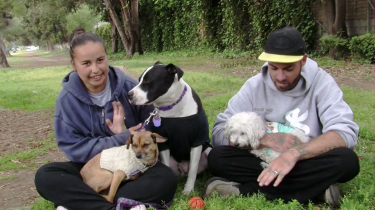 In another video, three sweater-clad dogs scamper around a Los Angeles park, while their companion, Judie, tells their backstory. And in still another clip, Myra races her spaniel mix, Prince, down a neighborhood street. The images have an every-person quality — a collection of random pet owners, explaining why they love their dogs. And that’s part of the point of the series: The people featured are homeless, and a focus on their relationships “humanizes” a population that is often neglected or shunned, according to University of Washington geography professor Vicky Lawson. 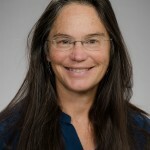 Lawson and her colleague, Wesleyan University postdoctoral researcher Katie Gillespie, studied these videos from the multimedia project My Dog is My Home, created by the New York-based nonprofit of the same name, and wrote about its essential themes for the journal Gender, Place and Culture. Their article, published online June 14, is a call to action, not only for services for homeless people and animals, but also for new understandings of them. Encountering homeless people, especially those with pets, generates a mix of emotional responses, Gillespie and Lawson said. On one of end of the spectrum are those who question whether a homeless person should be allowed to care for an animal, or who show sympathy for the pet, but not the person. On the other end are those who are moved by the pairing of two forsaken lives and want to help but don’t know how ­— other than, perhaps, by giving money. “How do we get from an emotional response to a transformative one?” said Gillespie, who received her doctorate in geography at the UW. In their paper, Gillespie and Lawson examined a selection of videos from the My Dog is My Home exhibit, which featured participants in Los Angeles, as well as photos of homeless people and their pets in Austin, Texas, taken by the Lifelines project. The researchers focused on the relationships between humans and animals, what those relationships demonstrated and what solutions might address the needs of both. Determining precise counts of homeless people ­— and their pets ­— is difficult because of varying state methodologies and definitions of what constitutes homelessness. The National Law Center on Homelessness & Poverty estimates up to 3.5 million people experience homelessness annually; of that, roughly 3 to 5 percent have pets, according to a Nevada-based nonprofit, Pets of the Homeless. But that percentage varies by community; in some areas, it is estimated that nearly one-quarter of the homeless population cares for animals. The video interviews reveal people who have suffered, or continue to suffer, from mental illness, inadequate health care or violence. But each person brightens when sharing the story of their dogs — in particular how their pets have made them feel loved and safe. They stress the importance of remaining with their dogs, even when it means forgoing housing that doesn’t allow animals, or food for themselves so that their pet can eat instead. And these relationships — and needs — are visible in any major city, she added. Whether on display in an exhibit like My Dog is My Home or living day to day on the streets of Seattle, homeless people and animals deserve attention, and respect. There are immediate steps that cities can take, Gillespie pointed out: More homeless shelters, tent cities and federally subsidized housing could accept pets. Then there are bigger issues to tackle, such as access to mental health care or affordable housing, and the surplus of animals bred to maintain a pet industry. Exposure to the issues faced by homeless people and their animals is a start, the researchers said. A future study could focus, for example, on what prompts passers-by to change their thinking and actions in meaningful ways. The research is informed, in part, by Lawson’s and fellow UW geography professor Sarah Elwood’s relational poverty research that was funded by a grant from the National Science Foundation. For more information, contact Gillespie at kathryn.a.gillespie@gmail.com or Lawson at lawson@uw.edu or 206-221-6075.